Aaron Franklin's Blog Update: Delegating Hats? 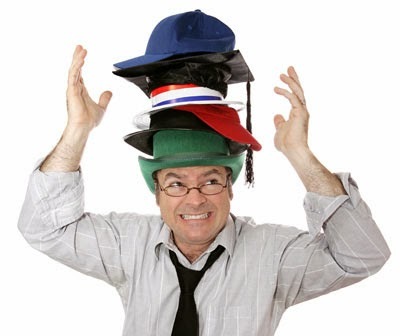 Most leaders are like hat racks, in that they wear a lot of hats. But here’s the problem with that, hat racks are only good for one thing—holding hats. Nobody designs a room around them. By and large, they sit in the corner where they’re hidden by a bunch of hats. People don’t notice them, unless they have a hat that they don’t want to hold onto anymore. It’s the same way with a leader who wears a lot of hats. It becomes the only thing you do. This happened to me. Years ago, I was leading a small music ministry at a church in Phoenix. But music wasn’t my only job. I was also in charge of the sound, visuals (the correct slides appearing on the screen at the right time), and the flow of the church’s service. Now, for a church music leader, that’s a relatively low amount of responsibility. But at the time, it was a lot for me. For a young and relatively inexperienced worship leader, I was wearing a lot of hats. Then one day, in a planning meeting, somebody mentioned how great it would be if we had video announcements. That would require somebody to shoot and edit video about what was going on around the church each week. So I said, “I’ll do it.” I was already over-committed, but I figured I had to if I wanted to stay valuable to the church. Well, as you could imagine, I wasn’t a very good video guy. And while I had all my time wrapped up in creating poor quality videos, my other responsibilities began to slip. I fell behind in scheduling audio technicians, so I had to try to run sound myself. As I did, I paid less attention to the band, who already suffered from trying to play poorly selected music. And forget about spending one on one time with my team members. They were getting almost no attention from me at all. I had ceased to be a leader. I had become a hat rack, always off in some corner trying to manage all my hats and doing no actual leading of any sort. Some leaders get extra hats put on their heads by their bosses. Others are like me, and choose extra hats. It doesn’t matter where your hats come from, the result is the same. Wearing too many makes you ineffective as a leader. You may be a great hat rack, but that’s all you’ll be. Now the goal isn’t to avoid receiving extra hats. Like I said, some leaders get them from their bosses. As a leader, your job is to give some of them away to other people so that each job can receive the attention it deserves. It’s called delegation, and it doesn’t come naturally to everybody. So here are the principles that I’ve learned about giving away hats that have worked really well. 1. Make personal asks. A lot of leaders will stand up in front of their whole team and ask who will step up. The problem with that is eventually you’re going to get the wrong person for the job. It’s more work to pray for God to show you the right person and then learn which people are right for the job, but it’ll lower the chance that you find the wrong person. Plus, when you tell someone that you see a skill or ability in them, they’ll feel empowered. Then they’ll stick with it longer, and your turnover rate will be lower. 2. Accept that others may not wear a hat as well as you. Sometimes you’re not going to have anybody more capable than you to hand a project over to. However, the problem stands that if you don’t hand it over, the rest of your work will suffer. When that’s the case, you’ll have to entrust the next best person for the job. The silver lining here is that sometimes people will surprise you. You may discover that you unknowingly couldn’t have picked a better person for the job. 3. Once you’ve crowned a team member with a new hat, frequent communication is the key, the lock, the knob and the whole assembly. The single largest contributor to burnout, anger and discontentment in the church is not theological, belief based, or a matter of differing personalities. It’s poor communication. If we became better communicators, we’d stop wasting time with the little problems we hate, and everyone on our team would be able to spend more time doing work that matters. Use the tools God has given you: phone, email, text message, Facebook, Planningcenteronline.com, etc. Use them frequently, and keep your team in the loop. This will help keep them happy with the hats they’re wearing. 4. Let people trade hats. I have put the wrong hat on a team member’s head before. It’s not pretty when it happens. I tried to make one of my sound technicians into a Tech Director. He was honored that I asked him, so he accepted the position. Within a couple months, he was burned out and discontent. He didn’t like doing the scheduling; and he really didn’t like me telling him how to work. So we had a conversation. He told me about his difficulties, and the bad attitude he felt he had developed. He took responsibility for himself, which I respect a lot. So, we talked about the other things he could do. Like most people, this guy has multiple skills. So he joined our team of songwriters, and became the lead audio engineer for our recording projects. Today, he brings a lot to our songwriter’s team and he is a killer recording engineer. Also when he moved over to songwriting and recording, it opened up the Tech Director position, which is now filled by another team member whose ability for running the audio team is matched by his enthusiasm for it. 5. Make honesty the prerequisite of wearing a hat. Most people on your team are not going to be honest with you. Many people have learned that they have to play their cards close to their chest to get by. Others just never learned the skills to communicate what they’re feeling. So make honesty a requirement of wearing a hat. When my old Tech Director became discontent with his position, I could tell. I was starting to wonder what was going on, and I was becoming increasingly concerned. Well, when I first brought him on, I made honesty a prerequisite of leadership in our ministry, and he took hold of that. When he felt discontent, he came to me in honesty about it, and we were able to work through it. Because of the overwhelming success I had with that guy, I work to be as honest with my team as possible. I also encourage their honesty as often as I can. As a leader, it’s your job to move people to act. It’s a job that’s impossible to do when you’re functioning like a hat rack. If that’s where you are, it’s time to start shedding headwear, and take back the mantle of leadership. It’ll be more work to have others be involved, and there won’t be as much certainty as there would be if you just did it yourself. But the benefit to you and your team is undeniable. Begin putting hats on other people’s heads, and start investing time back in your team. You’ll find that your burden is lighter, and you’ll be freed up to follow the passion for people that God gave you. You’ll be free to grow, and they’ll grow right along with you. The responsibilities I was reluctant to relinquish turned out to be opportunities for others. The very activities that drained me fueled other team members.